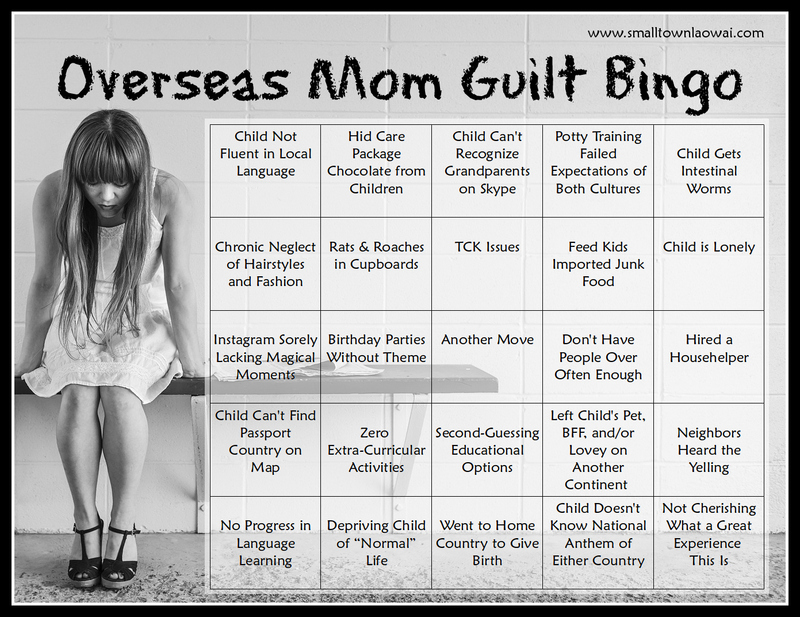 All moms struggle with mom guilt, but I think living overseas adds an extra layer of struggle. We get all the normal worries plus fun bonus ones like tropical diseases and second languages. We beat ourselves up for all the ways we feel like we’re failing our kids and families. Can you relate? If so, I have a fun game for you! How long did it take you to win?? Hang in there, Mama! Even if you feel like you are doing things wrong, can I tell you something? You are doing a great job. You’re not alone, and your kids are going to turn out just fine. Now go have some of that care package chocolate. I won’t tell the kids. I love you! And I don’t even know you! Thank you so much for this! I wish we were neighbors. The potty training! (We arrived when my boys were 2.5 and STILL not potty trained, and the transition to China did NOT make that happen any faster. I can still remember the humiliation of people pulling back their pants and tsking at me. My daughter wasn’t even 2 when she was potty trained, and I so sanctimoniously thought I’d NEVER have a 3 year old still in diapers. Haha.) The language! We’ve been here 4.5 years now without going home so my kids know none of their family except my sister! The roaches! (Ugh, Sanya is killing me in that department.) The loneliness of my daughter :(. I’ve stopped looking at Instagram and Facebook because it just enhances my guilt. (But I can’t say I miss the birthday party pressure–we’ve gotten to the point where we just set up a table at the playground and hang up some streamers and serve cake to whoever is playing outside then :).) I’d go indulge in some chocolate except I’m having a China-tummy night (la duzi). Thank you so much for this post and every post. Maybe it will take the edge off my guilt for a while. It IS wonderful adventure. April! If you’re ever in Kunming, or I’m ever in Sanya, we need to hang out. We can swap war stories! There is just so much to feel bad about, but take heart, my friend. There are loads of moms struggling with all these things. And in China, we ALL struggle with roaches. I hope you recover from la duzi quickly so you can get back to that chocolate. There are definitely plenty of things that aren’t included on this bingo card, and you hit on several of them. I don’t think it makes you Debbie Downer. Maybe Rita Realist?? There are just so many things that hum along in the background as underlying worries, or issues we feel guilty about. I think it’s good to bring them up to a conscious level (like in this “game”) because then we realize how much they may have been bothering us. Thanks for this. I’m not in China (though I did live there a long time ago) but are living out of our home country. I could tick most of these boxes. I’d add exposure to tropical diseases, more vaccinations than any other child they know and more comfortable in a plane/airport than bus or train and finally child thinks home country is a place to visit and go shopping but has never lived there. Those are great additions, Ruth! Yes, yes, yes. I could go on. Thank you! Three hospital visits?? So sorry, Laura. Those are all good additions (unfortunately) to the bingo card! When the waves of guilt come, it’s very good to remember all the positives. Thanks, Clara! OMG yes! I love this so much! Ha! This is great, Katja. I remember my kids also being amazed that so many people spoke English really well…when we were visiting the U.S.
Security issues. Eek! Talk about guilt! But I think you have the right attitude, and I bet your kids are awesome.